In a world controlled by an overbearing artificial intelligence named Aurora. Alie finds herself on the wrong side of Aurora’s attention, she finds herself blacklisted from society and on the run from people she once thought were her friends. This short story is available HERE on Patreon for free. To gain access to many other short stories by Eric Malikyte become a Patreon Member By clicking HERE! 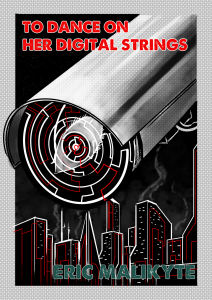 To Dance on Her Digital Strings started as a small 4000 word story, a cautionary tale about giving autonomous systems too much control over our lives, and what happens when we allow ourselves to become numbers instead of people. Then, somehow, this narrative about an artificial intelligence got woven into the mix. I’d just re-read 1984 at the time that I was writing the story. And I wondered what an AI program would end up being like if it had been built with big brother in mind.